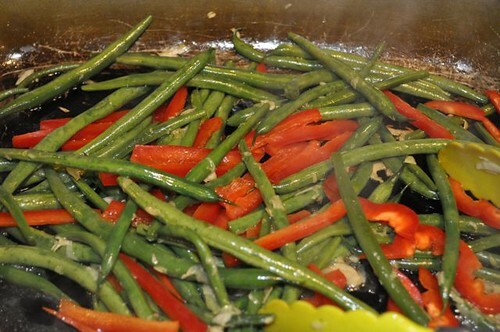 This is the quickest & easiest way to prep a whack of green beans – heat a pan, swirl in the EVOO, throw in the beans and a hefty splash of H2O (broth is best), and when the liquid is gone, mince in a clove or 2 of garlic, a little S&P, a shot of balsamic vinegar and your beans are ready for their close-up. 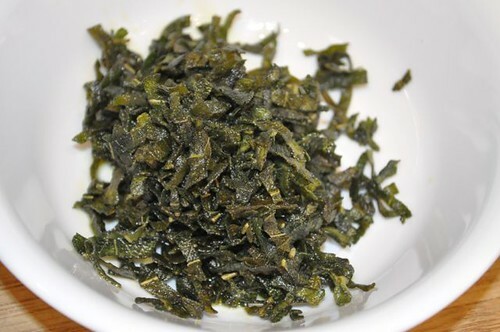 They should still be crispish – crispish? You know, slightly crispy. 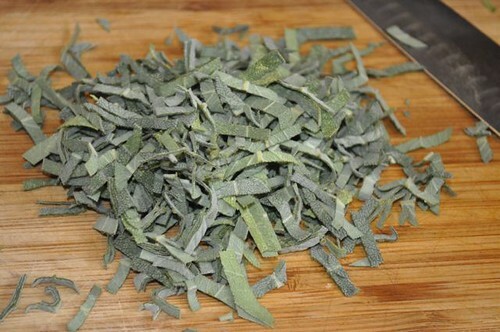 That’s the basic method to whichMegabox hd apk download for android you can add whatever moves you – I dolled them up with a little julienned red pepper and crispy fresh sage leaves but feel free to doll them up anyway you like – thinly sliced red onion or scallions would take you there, as would grated zucchini or fried proscuitto, or how about more ways than we can both possibly think of – let’s start with 75! 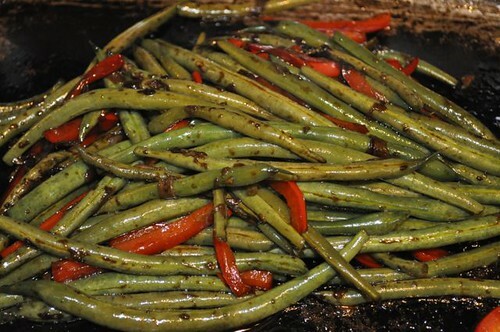 So save the cloying sauces for somewhere else, and find out what a green bean (and other garden sidekicks) are really supposed to taste like. 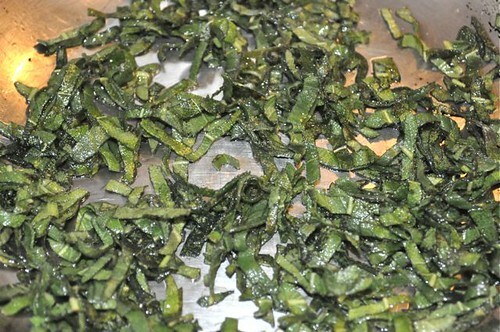 And just to tease you a little, imagine green bean pesto – yes, pesto made out of green beans. 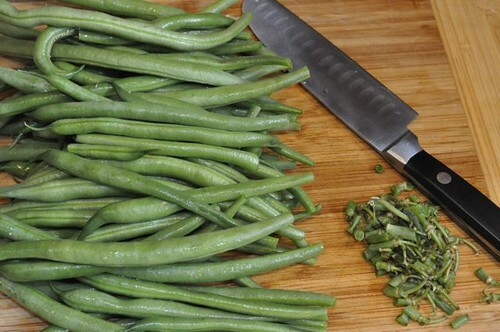 Too bad this little girl’s mother didn’t get out the food processor, some garlic, nuts and olive oil – ’cause when it comes to green beans, what you don’t know couldn’t possibly hurt you! 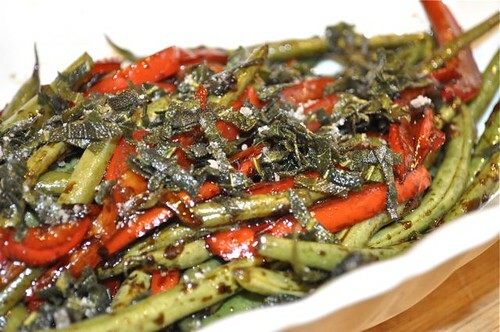 I’ll get on that green bean pesto soon, but in the meantime – lose your ever-lovin’ green bean mind! 1. 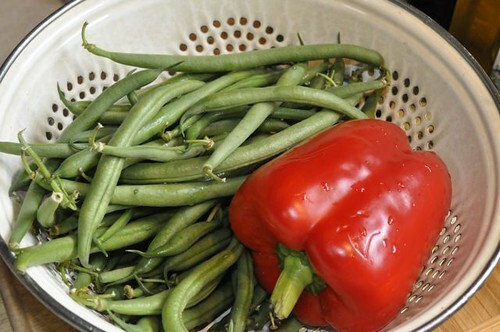 Get your beans and pepper(s) rinsed and ready to prep. 2. This sage bush is alive & well, and living outside my kitchen door. 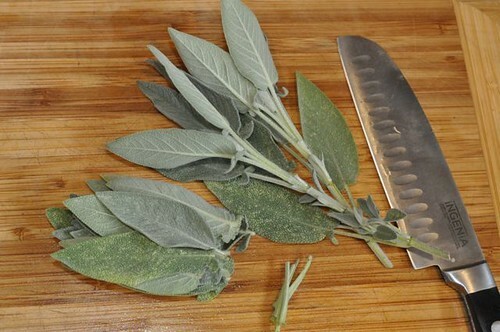 I’m going to share a trick that every Italian mama’s been doing with her fresh sage for centuries – she fries it up and sprinkles it wherever she pleases. 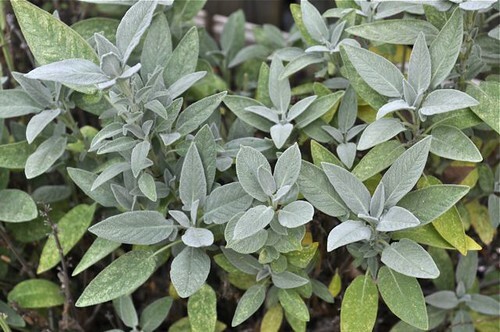 And FYI – sage is very easy to grow, is a perennial for those of us in the right zone and for those of us not, grow it indoors, so we can all have fresh sage, alive & well, and living outside (or inside) our kitchen doors! 3. Get the rest of the ingredients together. 4. Mix up the saucy stuff and set aside. 5. Simply trim the stem end – I never trim the tip and set aside. 6. 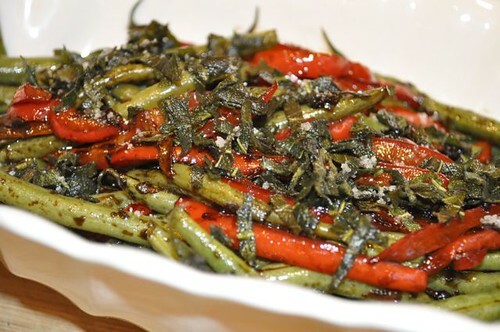 Julienne the red pepper (the shape matches the green beans) – slice or mince the garlic and turn your attention to the sage. 7. 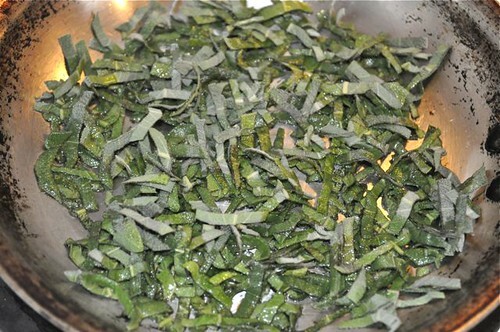 Pick the leaves off the stem, right at the base of the leaf, give them a rinse and pat dry. 8. Stack them on top of each other. 9. 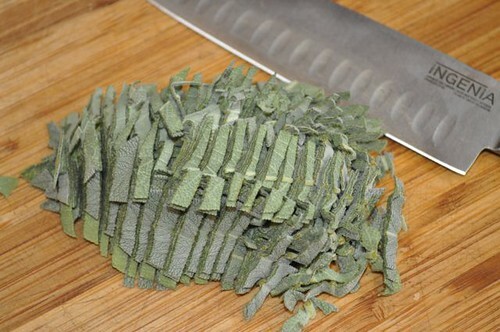 And run your knife through the leaves to make thin strips, aka chiffonade. 10. You’ll have a pile of feathery strips. 11. 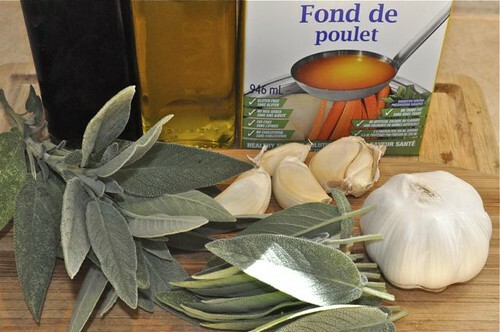 Heat a pan over medium-high heat, swirl with olive oil and add the sage. 12. 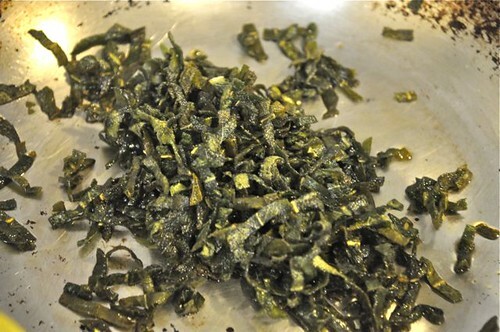 Continue sautéing until shrivelled and crisp. 14. 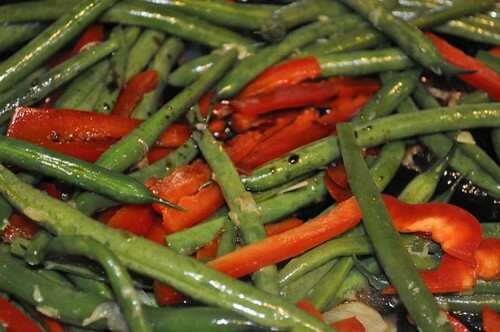 And this would be crisp – set the sage aside while you get the beans & peppers cooking. 15. 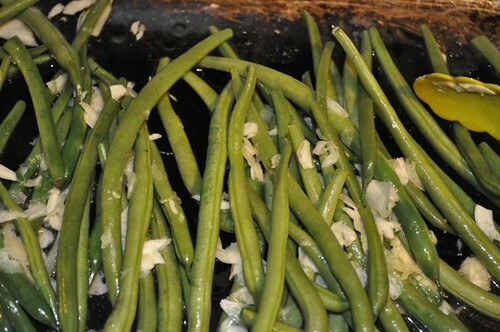 Heat a large pan over medium-high heat, swirl in the olive oil, add the beans, garlic & stock. 16. 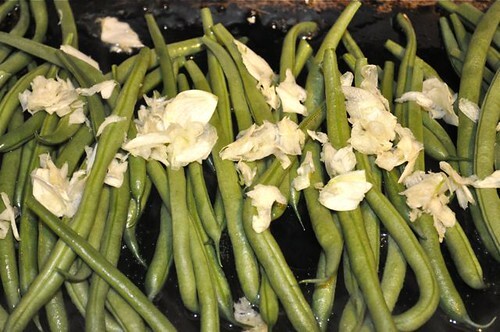 Continue cooking until the garlic softens and the beans get going. 17. 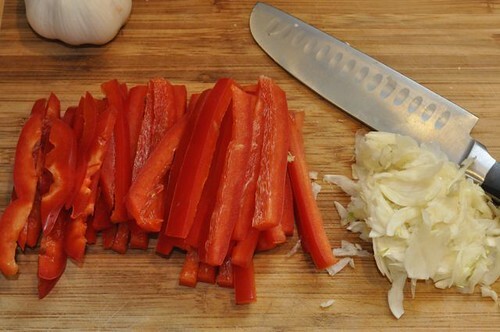 Add the red pepper. 19. 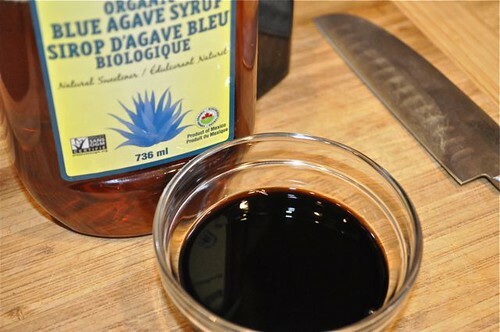 Stir it all around to coat completely and take it off the heat. 20. 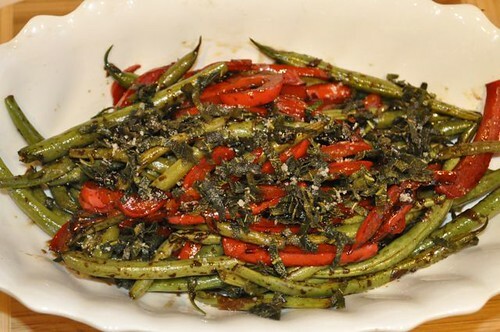 Transfer the beans to a serving dish and sprinkle with the crispy sage – talk about under the Tuscan sun! 21. Sprinkle with a little coarse salt and dig in! 6. Continue sautéing for another 3-4 minutes. 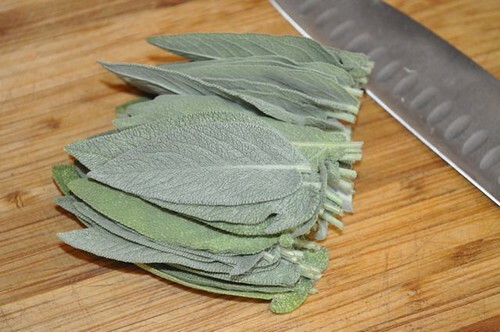 Remove from the heat, sprinkle the crispy sage leaves over top and dig in! Serve as is or over pasta – divine! FYI, here’s where a drizzle of balsamic reduction would be brilliant!